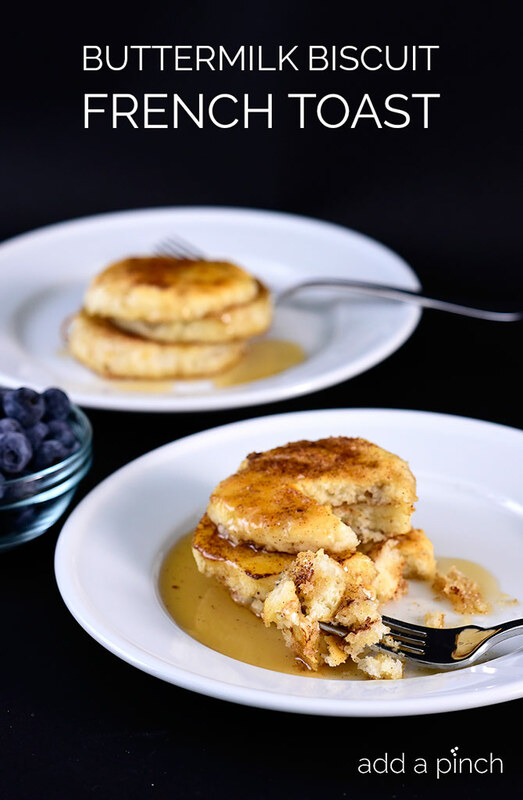 Buttermilk Biscuit French Toast – two breakfast favorites come together to make an out of this world meal! It’s no secret how much my family loves buttermilk biscuits. They are one of the things that I make the most in my kitchen and one of the things that I am most proud that my husband and son know how to make just as well, if not better, than I do! Occassionally, we have a few left over that I stash away to make breakfast sandwiches the next morning, or even slather them with a little bit of butter, top with them cheese and toast them for a quick cheesy biscuit toast. But one of my absolute favorite things to do is to make this buttermilk biscuit French toast. 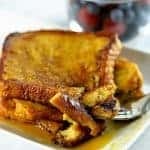 To make them, I begin with my perfect French toast recipe and use buttermilk biscuits instead of any other type of bread. 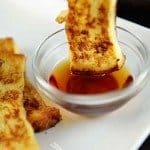 The buttermilk biscuits lend a flavor to the French toast that is unique and out of this world, in my opinion. Well, and by the way my family gobbles it up, it is pretty obvious they agree as well! Ha! I like to whisk all of the ingredients for the French toast batter together right in the pie plate or dish so that there are fewer dishes dirtied in the process, which means fewer to be cleaned as we’re rushing around in the mornings! 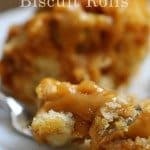 It only takes a few minutes to whisk it all together and then I split the biscuits in half and dip them into the batter and right onto a griddle or into a skillet that I’ve melted a little butter on. In just a few minutes, the biscuits are golden brown and ready to flip over for the other side to do the same. 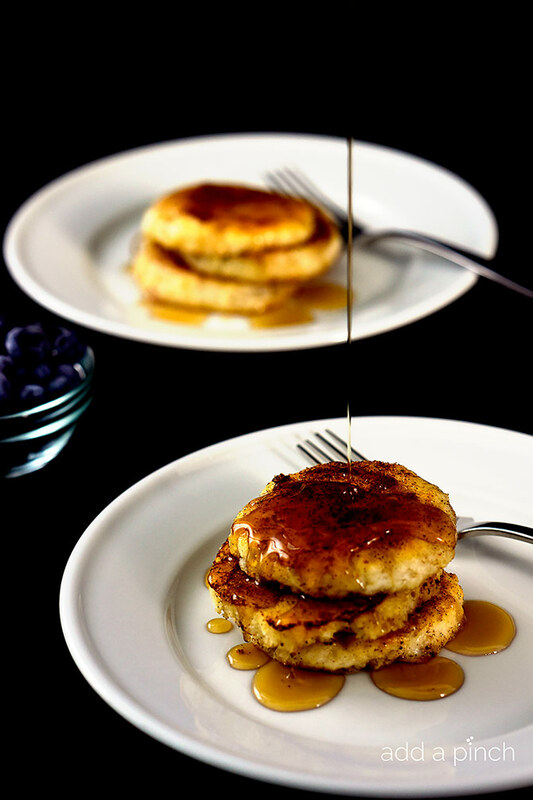 Then, straight onto a plate with a drizzle of maple syrup and watch them disappear! And for little ones, you can also serve them with the maple syrup on the side for dipping rather than pouring over the top. They love it! Here’s my Buttermilk Biscuit French Toast Recipe. I sure hope your family loves them as much as mine does! 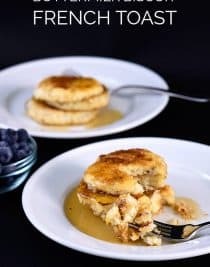 Buttermilk Biscuit French Toast - two breakfast favorites come together to make an out of this world meal! 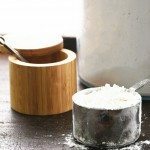 Whisk together eggs, milk, salt, sugar, vanilla, and cinnamon in a flat-bottomed pie plate or baking dish. Split biscuits in half and place a few at a time into the egg mixture and flip to make sure both sides of biscuits are well-coated. Melt butter in a large skillet or on a griddle. Place biscuit halves in skillet or on griddle and cook until golden brown on each side, about 3-4 minutes. Serve immediately or keep warm in oven until ready to serve, but no longer than about 30 minutes. Someone better stop me before I make this because I’m going to eat the whole thing! This looks insanely amazing! Sounds delicious, Robyn. These are two great breakfast foods and what better way to enjoy them than together. I’d think the biscuits would soak up all those wonderful ingredients but not come apart like regular loaf bread does. Oh gosh, french toast meets buttermilk biscuits??? That is heaven on a plate right there. With a healthy drizzle of Vermont maple syrup of course. 🙂 Happy Monday, Robyn! 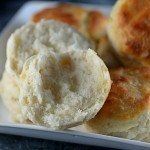 I made your buttermilk biscuits a week ago and they were so good. This is a great way to use any leftovers. Of course I would have to double the recipe if I needed leftovers…..they were gobbled up quickly. 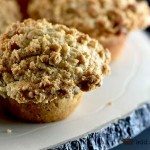 I am a recent new follower of yours, but I must say, I am loving the recipes you share! Can’t wait to try these biscuits and then the french toast application myself! YUMMMM!! !